Green Ronin Publishing announced today that it has signed a licensing agreement with DC Comics and will be releasing the DC ADVENTURES RPG book this August. The game is based on Green Ronin’s Mutants & Masterminds, the leading super-hero RPG in the tabletop gaming world. The DC ADVENTURES game will consist of four books, each done in full color and beautifully illustrated by top comic artists. The line launches in August with the DC ADVENTURES Hero’s Handbook. Following it will be Heroes & Villains, Volume 1 in the fall. Then 2011 will see the release of Heroes & Villains, Volume 2 and DC ADVENTURES: Universe. Since then, Green Ronin has been running a Design Journal blog. If you are interested in this game, this blog is definitely worth reading. They’ve already revealed the Power Levels of the big heroes and villains (posted below just to cause some argument amongst the geeks). 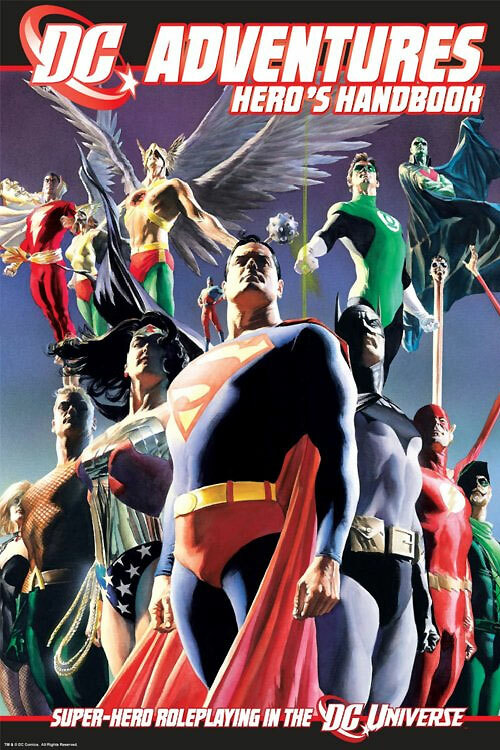 Black Adam (16), Black Manta (10), Brainiac (13), Catwoman (10), Cheetah (12), Circe (14), Darkseid (16), Gorilla Grodd (12), The Joker (11), Lex Luthor (14), Prometheus (14), Sinestro (14), Solomon Grundy (14), Vandal Savage (13). Additionally, they’ve published the stats for Green Lantern (Hal Jordan). Click here to check out the Design Journal blog. You can pre-order two of these books, Hero’s Handbook and Heroes & Villains vol 1, from most local comic book shops or Amazon.com. Can’t wait to get this game in August! Anyone else thinking about getting this game? Already ordered from Amazon (as we don’t have such things as LCS or FLGS down here in the backwaters of southern England). Doubt very much I’ll ever get to play this, but the idea is to mine it for facts and figures… especially now I’m riding a strong “Villains & Vigilantes Is Coming Back” vibe. And anyway, it’ll stand as yet another great reference book about DC’s characters and universe – and you can never have too many of them. I know nothing about the Mutants & Masterminds system, but at least it’s not been eaten by the D20 blob. The original Mayfair DC Heroes is still one of my favorite systems, the best I know for really high-powered play. Mutants and Masterminds is a good system, so having DC on it is a nice coup. That having been said my best hope for playing this is that one of my friends buys it and sets up a game while on a fishing trip or something! I think it’s interesting that Captain Marvel has been ranked on the A-list with Superman and Wonder Woman. He’s usually put on the B-list with Martian Manhunter. Darkseid being ranked higher than Superman and the top-level heroes makes sense to me, but I’m not sure that I agree with Black Adam being put there. I like him and all, but he’s always been portrayed as an equal to Captain Marvel, Superman, etc., albeit more ruthless. I did run a M&M’s 2nd ed campaign, nice enough system BUT still quite influenced by the “D20 bug” as someone else mentioned. Seems like the changes they’ve made for this and their 3rd edition are sensible (different ratings and labels on attributes, system seems to work a bit differently etc.) There’s always going to be people disagreeing on how powerful X,Y or Z should be, but yet again, even if the PL is higher doesn’t necessary mean that they’re more powerful, which people tend to stare themselves blind at. Heroes with lower PL might be built on more PP’s than a higher PL hero, because they’ve got more experience and are more diversified/ adaptable etc. I’ll probably buy this book as I’m a fairly avid DC reader, if I don’t get to play it, at least it’s a nice collectible to have.